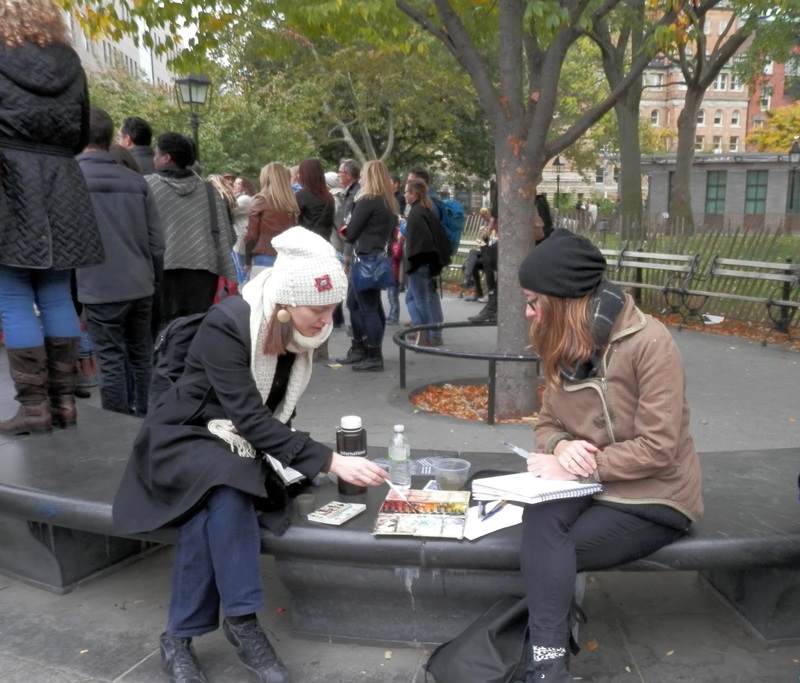 Sketching in Washington Square Park on Saturday for the 49th World Wide SketchCrawl was great! There was something going on everywhere you looked with the protesters, the police, the normal musicians and entertainers...and our group of nearly 30 sketchers. It was a madhouse at times! I think we added to the entertainment too. 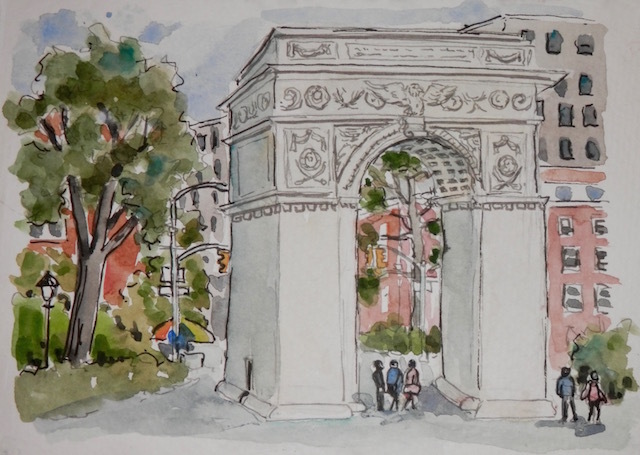 I sketched the arch early in the day. 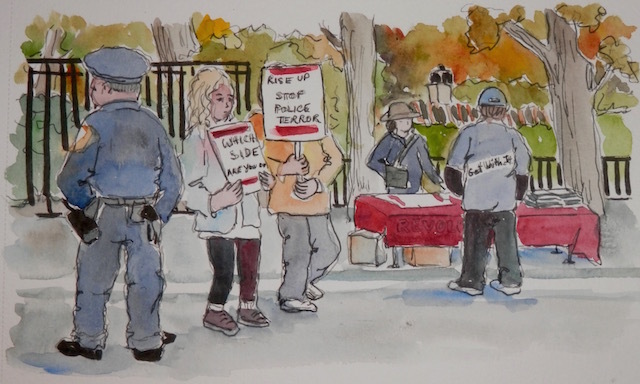 Of course in the time it took me to sketch it, the scene changed as the bagpipe players came along and then all the protesters with their signs. I only included a few people. 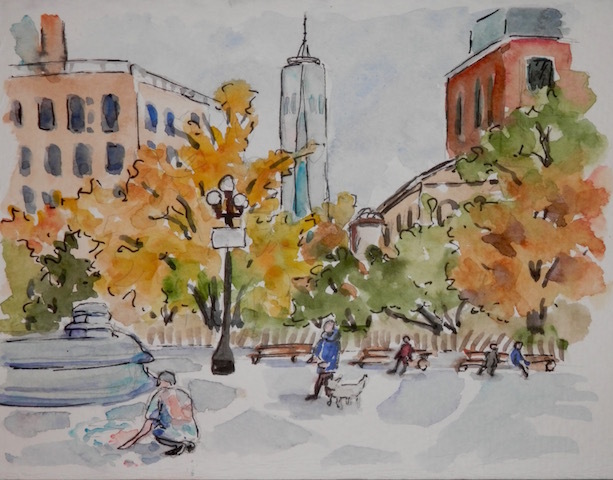 Looking in the opposite direction I was able to see the Freedom Tower peeking through the trees which were really starting to pop with color. After lunch I wanted to do a sketch of some of the protesters and thought I had the right spot because they were all lined up with their signs. But as soon as I started sketching they were off marching to somewhere else in the city...so I only caught a few of them and a police officer too. 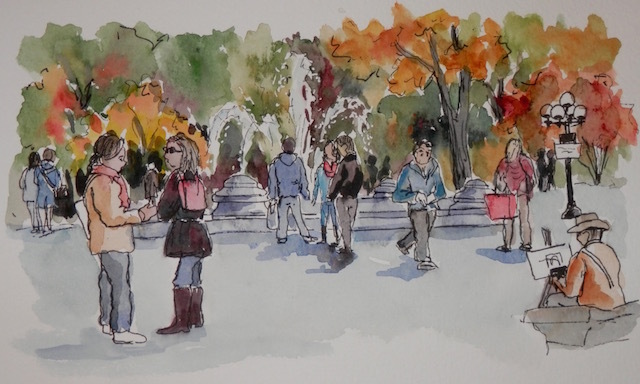 My last sketch was of the fountain and some of the activity around it. Our group got really into sketching as you can see in the photos below. Getting down the details with a water brush. Sketchers enjoying the cold day. "Show and Tell" is always a fun part of the day...we were lucky to fit into the bar this time since I think 20 of us showed up at the end of the day. lol We welcomed some new sketchers and Thomas Thorspecken visiting from Orlando. Seeing the other sketches and sharing information, materials, and in formation is a perfect finish to a day of sketching. A small part of the group. Thomas Thorspecken sharing one of his sketches. Hugo shows us his markers. Once again you captured a nice variety of the day. So many things to sketch there! I like all the people you captured at the fountain. Thanks, Susan. 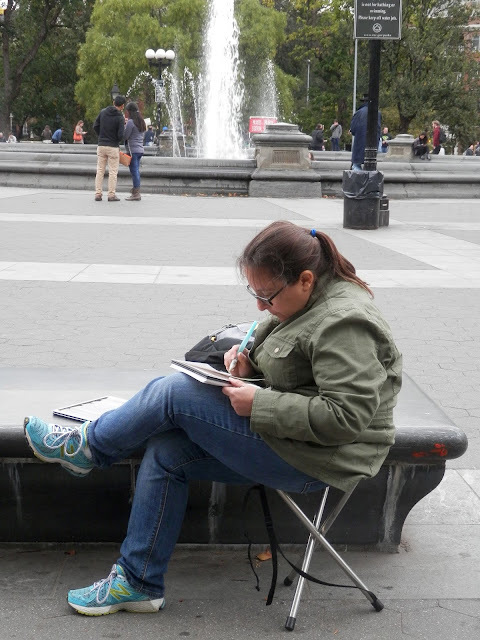 There were so many different views to sketch.